Senator Bernie Sanders (I-VT) introduced legislation today that would reduce the cost of college tuition to an amount that working families can afford. Free. Sanders made a straightforward case for his groundbreaking legislation to a large crowd in front of the U.S. Capitol. With Sanders at the Capitol: Alexandra Flores-Quilty, the vice president of the United States Student Association. The cost of higher education in the United States has jumped over 1,200 percent since 1978. Over the same timeframe, wages have stagnated for all but the richest Americans. Those richest, Sanders believes, ought to help foot the bill for increasing access to higher education. The financial transaction tax that Sanders introduced today as standalone legislation would yield an estimated $300 billion and has won support from over a thousand economists and National Nurses United. 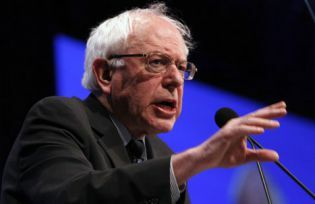 The Sanders financial transaction tax, also known as the “Robin Hood tax,” would place a mere 0.5 percent levy on stock trades, a 0.1 percent fee on bonds, and a 0.005 percent fee on derivatives. The Sanders free public higher ed tuition legislation, titled the College For All Act, would provide two federal dollars to every dollar that states put towards education if the state agrees to reduce public school tuition to zero. The total cost of tuition that students pay at public colleges and universities runs about $70 billion. The bill also includes a number of reforms students and education advocates have long sought. The bill reforms work study to better help students from low-income families, simplifies the financial aid application process, and enables students to access much lower interest rates on federal loans. Most progressive higher education legislation beats around the bushes and avoids taking on the core issue behind the rise of student debt: not enough public investment. Those concerned that we can’t afford this investment need look no further than the excesses of Wall Street to see we have plenty of money in this country to invest in higher education, if we chose to do so. With the College For All Act, Sanders is providing a bold vision for how this country could get serious about addressing the needs of young people and bringing America’s economy into the 21st century. Josh Hoxie is the director of the Project on Opportunity and Taxation at the Institute for Policy Studies.